Your car is a big part of your life, and it’s there for you in times of need. There’s the morning and afternoon commutes, the weekend trips to the dog park, and the post-gym workout drive. All this car use results in an interesting collection of smells that might require a bigger solution than a simple air freshener. Some people have even bigger vehicle problems, like mold and bacteria. Keeping odors and bacteria out of your car requires a combination of prevention and correction. 1. Avoid smoking: While many smokers enjoy the occasional car-cigarette, this is one of the easiest ways to create an unwelcome odor. Cigarette smoke lingers and the smell clings to seats, carpet, etc. Fixing this smell can be difficult and requires extensive deep cleaning. Learn more about how to remove smoke from your car. 2. Stop eating and drinking. The day you start eating and drinking in your car is the day you lose the battle. 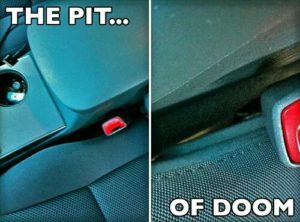 If you are prone to eating while driving, then you understand the dangers of the pit of doom. If you are going to eat in your car, dispose of trash outside the vehicle instead of filling up a bag that may sit in the car for months. It’s also a good idea to pull over when eating and drinking. Driving and eating gets messy, and not to mention, is an unsafe practice. 3. Air it Out. If you have a spill or a smell seems to be linger, open up the windows for a bit (just don’t let any rain enter). Some air fresheners can also help to temporarily mask the smell. If you’ve had a spill it might help to leaving baking soda out or place a small bowl of vinegar and water near the spot where the spill occurred. 4. Invest in Seat Covers. Seat covers can prevent many types of car odors. If you have a pet that occasionally takes a ride with you, then a seat cover will not only keep their smell from sticking around, but it also prevents your pet from damaging the seats. Seat covers are also good if you work outside or take frequent trips to the gym. Seat covers are waterproof and sweat-proof. 5. Get a Detail. Of course sometimes it’s just too much work to take care of all these weird odors yourself. Hiring a professional to complete an auto detail is simple. It will save you hours of your time and money. Auto detailers know what products to use and have the best equipment for getting rid of bad smells. We’re all human and our cars will eventually be in need of some cleaning, but at Rick’s we try to simplify the process for you. We’ll even pick up your car for you, making it a completely stress-free way to get your car thoroughly cleaned.